at the hip - Pb. the circumference of the shoulder Pop. the width of the backs of 25-30%, the width of the front 10-20%, the width of the openings 50-65%. Increase in length backless to waist in the dress is 0.5 cm, the depth of the openings are 1-2. 5 cm, the width of the neck is 0.5-1 cm. Depending on the demands of fashion and the deepening of openings may increase to 3-5 cm and more (up to waist line). A significant deepening of the openings is characteristic for products of soft shapes, shirt casual, square armholes, with sleeves zelenolistnye. For the same size is given by the construction of all subsequent drawings. By the cut and style of dress is very various. Any shape is developed on the basis of drawing classic dresses with vtachnoy sleeve. Original in building design drawing dresses is a vertical line taken in the middle of the back, and the horizontal level of the top of the neck backless. The point of their intersection is A0. To find the line of armhole depth, from point A0 down vertical line is the cut equal to the measurement of the distance from the highest point of the designed the shoulder seam at the base of the neck to the level of the rear corners of the armpits (ITRS) with the addition of the freedom arm openings, and a dot G.
to the Right of the point G draw a horizontal line. Waist line find, postponing period, is equal to the dimension of length backless to waist (DTS) increase the length of the back, and put the point T.
Right from the point T draw a horizontal line. Line of the hips is defined as follows. From point T down on the vertical line delayed period equal to half the measurement of the length of the back minus 2 cm, and a dot B. From point B to the right draw a horizontal line. From point T down on the vertical line delayed period equal to the length of the skirt, and put a dot N.
TN = Du = 75 cm From the point N to the right draw a horizontal line. To the right of A0 is delayed a period equal to the dimension of poluobhvat chest of the third (Sh) with the addition of free customized fit at the chest line, and a dot A1. Through the point A1 is held down, a vertical line. The intersection of this line with the line of the chest is indicated with a dot G3, with waist - point T8, the line of hip point B3, with a bottom line point N3. From the point A0 to the right along the line А0а1 delayed period equal to the width dimension of the backrest (SHS) with the addition of free customized fit, and a dot. А0а = SS + N = 18,3 + 0,8 = 19.1 cm. From the points a, A1, A2 down are the vertical lines that limit the area of openings in width. From the point T8 in the line of mid front up is delayed a period equal to the length measurement of the front to the waist (DTP) with the increase in length backless to waist. 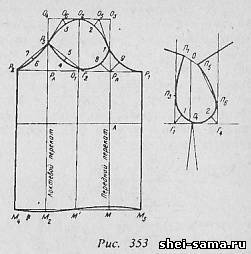 In drawing structures of, in front of which consists of two parts, the delayed cut А3А3 that focus on proper execution of the line of prosanos with regard to the shape of the breast. For typical shapes А3А31 equal to 0.5 cm, for figures pereghibati with rear shoulder belt - 1-1,5 cm, stooped - 0. From the point A0 to the right and point to the A31 or A3 horizontal segments to the left are laid А0А2 and А31А4 determining the width of the neck. From point A0 at the mid-line of the back is delayed a period equal 1/3 cut А0А2, and a dot A. А0А = 1/3 X 7.2 = 2,4 see А0А Cut determines the depth of the neck backless. The depth of the neck of the front is taken to be 1 cm more than its width. The amount of deviation of the middle line of the back from the vertical is in the range of 1-2. 5 cm at the waist and depends on the shape of the dress, the degree of fit and the presence of a seam in the middle. From the point T to the right of the waist line is deposited right cut and put the point T1. 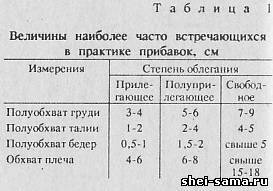 ТТ1 = 1.5 cm. Point A and T1 are connected by a straight line that continues down to the intersection point N1 with the horizontal drawn through the point N.
The position of the end of the shoulder point of the back L1 is the intersection of the two arcs. From point T1 by a radius equal to the height of the shoulder slash (VPC) plus the increase, is serif. Т1П1 = 43,2 + 1 = 44,2 cm At the intersection of the arcs is point P1. From the point P1 is lowered perpendicular to the vertical, limiting the width of the back, and put a dot P2. To determine the position of the top front area of the openings made additional construction. From the point G4 up straight is the line, equal to 1/3 X Г4П4, and put a dot P6. From the point P6 to the right draw a horizontal line, which is the cut П6П60 = 0.6 cm From point П60 radius П60П4 to the left of the point P4 is the arc where after you build a breast tuck is determined by the point of the openings. From the point G3 to the left is the cut Г3Г6 equal to 1/2 X minus 1 Г3Г4. From the point G7 with a radius equal Г7А4, is the arc on which is deposited the amount of solution a chest tuck А4А9. Cut А9П5 equal to the dimension of SHP - 13,3 cm armhole Line is through the points P1, P3, I, G2, 2, A6, 4, A5. Point G5 determines the position of the side seam on the line of armhole depth. Г1Г5 = 1/2 X Г1Г4 - 1 = 1/2 X 12.6 - 1 = 5.5 cm. Down to the intersection with the line of the hips is a vertical line. The point of intersection with the waist line is designated by a point T2 with the line of the hips - B2. At the hip line segments are deposited, is equal to 1.5 cm Б2Б4 = Б2Б3 = 1.5 cm. The width of the backrest and shelves at the bottom is taken equal to the width of it at the hip line for a straight silhouette and 2-5 cm for more products attached and fitted silhouettes. The middle line of the back is always perpendicular to the line of the bottom of the back. Lines of the side sections aligned sections; up from the waist line and then down from the waist line. The bottom line of the front is a smooth line connecting the points H3 and H4. Sleeve (Fig. 353). Design drawing sleeve is constructed in accordance with the measurements of the hands and arm openings. Are the two mutually perpendicular lines with the intersection point O1. From the point O1 is delayed up to the height of the top part of the sleeve, which is defined as follows: the main product drawing (Fig. 353 b) connected with a straight line of points P1 and P5. From the middle of this cut on the line of the depth of the armhole is lowered perpendicular OO1. OO1 - 2,5 = 18 and 2.5 = 15.5 cm. Through the point O2, draw a horizontal line. In both directions from the point O1 is delayed by 0,5 width of the sleeve. Width is the measurement of arm circumference (Op) plus the increase in free fit. From the point RP and RL are restored to a straight perpendicular. From the point O3 is deposited down the length of the sleeve. О3М = D sleeve = 58 cm From the point O3 is the cut down, equal to half О3М plus 3 inches and put a dot L.
From the points M and L are to the left of the horizontal line. For holding the line okata find the additional point. The position of the reference point 1 corresponds to the position of the point P6 on the armhole shelves. RP1 = Г4П6 = 6.4 cm, the Position of the reference point P3 corresponds to the position of the point P3 on the armhole of the back. РлР3 = Г1П3 = 8,6 cm From the point O3 to the left is the cut equal to half cut О2О3 minus 2, and is point O5. From the point O2 to the left is the cut equal to half cut О2О4, and put a dot About. A6 - 3 = 2.0 cm (along the bisector). Point 1, and P3 O5, O6 are connected by straight lines. Are the support point for the decoration of the lower part of the crown. From the point RP to the left is delayed a period equal to half the width of the armhole plus 1, and is preceded by a point G2. Point P3, G2 are connected by straight lines. Cut Р3Г2 is divided in half, from the middle of the segment is restored to the perpendicular, is equal to 1-2 cm from the bisector point of the RP is delayed a period of Rp8, equal to the segment G42 (drawing shelves) plus 1. The lower part of the sleeve takes place around the front and elbow rifts. The weld is located in the middle of the sleeve. the Points P2, P3 are connected by a straight line from the middle of which is restored to the perpendicular, equal to 1-1,5 cm. Rp8 = Рп9. The bottom line is shortened by 1 cm on the front roll, lengthened by 1 cm on outside of roll.